McCracken references Smith's History of Dutchess County, p. 246. David Buttolph was born on 24 May 1709 at Simsbury, Hartford Co., CT. He was the son of Sgt. David Buttolph and Mary Buck. David Buttolph married Mary Holcombe, daughter of Lt. Nathaniel Holcombe and Martha Buell, on 3 September 1731 at Simsbury, Hartford Co., CT.3 David Buttolph was CHURCH MEMBERSHIP on 23 August 1741 at Wintonbury, Hartford Co., CT. He died on 20 February 1783 at Northeast, Dutchess Co., NY, at age 73. Timothy Case was born on 16 March 1707/8 at Simsbury, Hartford Co., CT. He was the son of Capt. Richard Case and Amy Reed. Timothy Case married Sarah Holcombe, daughter of Lt. Nathaniel Holcombe and Martha Buell, on 25 September 1730 at Simsbury, Hartford Co., CT.2,3 Timothy Case died on 1 April 1754 at Hampshire Co., MA, at age 46. Ruth Cost Duncan only lists 5 children and calls Dorothy doubtful. However, Hartford County Probate records for Apri 1754 Show that Sarah's brother was appointed guardian to Ephraim, aged 13, Amy, aged 10 and Dorothy age 7. Case, Timothy, Page 17 - 22 April 1754: Timothy , aged 17 and Marsh, aged 15, children of Timothy Case, late of Nine Partners, decd. chose their uncle Nathaniel Holcomb, Simsbury, to be their guardian. Nathaniel Holcomb appointed guardian to Ephraim, aged 13; Amy, aged 10, and Dorothy age 7. Their mother consenting. [S101] Ruth Cost Duncan, John Case, Page 13/Item 19. Martin Holcombe was born on 27 July 1741 at Simsbury, Hartford Co., CT.5,6 He was the son of Lt. Peter Holcombe and Margaret Case.6 Martin Holcombe died in 1812. Settled in Southwick, Mass; was an inn-keeper, having moved there from Granby and Simsbury. [S65] Deanna Holcomb Bowman Thomas Holcomb, Vol. I:Pgs. 71, 160/Item 8101. [S25] Hannah McPherson, Holcombe Genealogy, Page 187/Item A-8-1-10-1. Died in the French and Indian War. Jacob Holcombe was born on 1 April 1743 at Simsbury, Hartford Co., CT.1 He was the son of Lt. Peter Holcombe and Margaret Case. 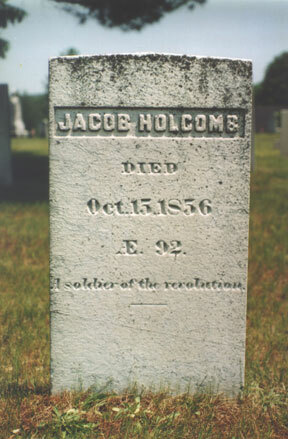 Jacob Holcombe died before 1764. Noadiah Holcombe was born on 5 September 1744 at Granby, Hartford Co., CT.3 He was the son of Lt. Peter Holcombe and Margaret Case. Noadiah Holcombe died on 23 February 1745/46 at age 1. Seaver is confusing on Nodiah. He shows two children with this name. The first born 1794, (probably a typo for 1749)died 1829, who married Affiah Buttolph. The second born in 1749 who married Apphia Butler. McCracken and Bowman seem more logical. The first Noadiah being born in 1744 and dying in 1745/6. The second Noadiah, the first male born after the death of the first Noadiah, was also named Noadiah in 1749. Dora Marcia Spring lists the children on her supplemental application and lists both the way McCracken and Bowman do. However she does not mention the first three children mentioned here Azariah Damaris and Mary. Simsbury Soldires lists the first three children; Weir the last two. Margaret Holcombe was born on 18 February 1745/46 at Granby, Hartford Co., CT.6 She was the daughter of Lt. Peter Holcombe and Margaret Case. Margaret Holcombe married Col. Giles Pettibone, son of Jonathan Pettibone and Martha Humphrey. [S65] Deanna Holcomb Bowman Thomas Holcomb, Vol. I:Pg. 160/Item 8102. [S25] Hannah McPherson, Holcombe Genealogy, Page 189.1/Item A-8-1-10-3. Col. Giles Pettibone was born on 9 December 1735 at Simsbury, Hartford Co., CT. He was the son of Jonathan Pettibone and Martha Humphrey. Col. Giles Pettibone married Margaret Holcombe, daughter of Lt. Peter Holcombe and Margaret Case. Col. Giles Pettibone died in 1810 at Norfolk, Litchfield Co., CT.
Died young. Seaver spells it Rushmore, McCracken spells it Rushamor. Rushmore Holcombe was born on 30 November 1747 at Granby, Hartford Co., CT.1 She was the daughter of Lt. Peter Holcombe and Margaret Case. See the notes on Noadiah's older, deceased brother by the same name. We are following the assumption, like McCracken, that the first Noadiah died and the next son was then also named Noadiah. Seaver shows the two Noadiah's marrying Affiah Buttolph and Apphia Butler, apparently the same woman, either last name could also have been a married name and she a widow as she was in her 30's when she married Noadiah. Probably the Noadiah who was in Massachusetts, a Sergeant, Capt. Malcolm Henery's Co., Col. David Brewer's (9th) regt; company return dated Oct. 7, 1775; also, Capt. Henry's co., Col. Rufus Putnam's (late Brewer's) 9th regt; order for bounty coat or its equivalent in money dated Roxbury, Dec. 23, 1775. [S65] Deanna Holcomb Bowman Thomas Holcomb, Vol. I:Pg. 160/Item 8104. [S25] Hannah McPherson, Holcombe Genealogy, Page 189.1/Item A-8-1-10-5. Affiah Buttolph was born on 14 November 1756. She was the daughter of Capt. Jonathan Buttolph and Jerusha Dibble. Affiah Buttolph married Noadiah Norman Holcombe, son of Lt. Peter Holcombe and Margaret Case, on 28 May 1778. Affiah Buttolph married Daniel Fairchild. Affiah Buttolph died on 15 October 1839 at age 82. Seaver spells his name Asahel. Bowman shows the second marriage after his death! He was a volunteer from Simsbury at the Lexington Alarm. He was in Sheldon's Light Dragoons to the close of the war, and rose to the rank of captain. He was a pensioner when he died, 1832, aged eighty. [S25] Hannah McPherson, Holcombe Genealogy, Page 190.1/Item A-8-1-10-6. [S419] Carol Laun, Beneath These Stones, Page 110. [S807] Find A Grave, online http://www.findagrave.com, memorial ID # 79514330. [S25] Hannah McPherson, Holcombe Genealogy, Page 190.1/Item A-8-1-10-6-1. 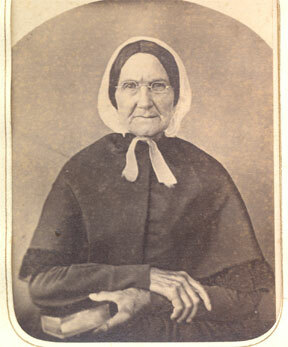 Maria Holcombe was born in 1804 at Granby, Hartford Co., CT. She was the daughter of Asahel Holcombe and Hannah Smith. Maria Holcombe married Dr. Roland Holcombe, son of Samuel Holcombe and Sarah Johnson, on 30 December 1829. According to Carol Laun at the Salmon Brook Historical Society, Maria (sometimes known as Hannah) remarried after Dr. Roland died and in probate records she is named guardian to Roland's children. Luman was recorded in the 1850 New Brittain, Hartford Co., CT, census as an iron founder. [S65] Deanna Holcomb Bowman Thomas Holcomb, Vol. I:Pg 161. [S23] Jesse Seaver, The Holcomb(e) Genealogy, Page. 46. [S25] Hannah McPherson, Holcombe Genealogy, Page 190.1/Item A-8-1-10-6-4. [S45] Albert C. Bates, Simsbury, Page 294. Seaver notes that this Holcombe is son of Lieutenant Benaha, Joshua Line. [S45] Albert C. Bates, Simsbury, Page 242. Keziah Holcombe was born on 23 November 1755 at Granby, Hartford Co., CT.3 She was the daughter of Lt. Peter Holcombe and Tryphena Case. Keziah Holcombe died on 29 April 1830 at age 74. Peter served seven years in the Connecticut line militia in the American Revolution under General George Washington. He fought in the battles of Monmouth, Brandywine and Trenton and spent the winter at Valley Forge in Capt. Burr's Co., Col. Moseley's Regt. After the battle of Monmouth June 28th, 1778; arrived at camp on the Hudson, July 13, 1778; promoted from the ranks until commissioned Lt. Col. On record in Hartford, Ct., past 73 years old, June 27, 1833 and in 1832 as a Revolutionary pensioner for services as a private in the continental Line, at $60 per year. [S25] Hannah McPherson, Holcombe Genealogy, Page 190.1/Item A-8-1-10-10. [S45] Albert C. Bates, Simsbury, Page 98. Was in War of 1812. He was killed by a fall from a tree which broke his back. He and Rachel have an inscribed memorial stone marking the site of the roots of that tree. The memorial stone says "who was killed on this spot by a fall from a tree 30 Apr 1834", which differs from other records of the date. "Ardin" was enumerated in the 1810 Granby, Hartford Co., CT, federal census. He had 2 sons under 10 (probably Arden Jay and Guy), and a daughter under 10 (probably Lorenda). He was 26-44, his wife was 16-25. Arden was enumerated in the 1820 Granby, Hartford Co., CT, federal census, page 12. There were 4 boys under 10 (probably Alson, Chester Reuben, Asahel, and Frederick), and 2 boys 10 to 15 (probably Arden Jay and Guy). Arden was 26-44. There was one girl under 10 (probably Rachel), and one 10-15 (probably Lorenda; if Irene was born 1810-1820 she must have been out of the household at the time of the census), Arden's wife was 26-44. "Ardon" was enumerated in the 1830 Granby, Hartford Co., CT, federal census. There were 2 boys 10-14 (probably Asahel and Frederick), 1 boy 15-19 (probably Chester), 1 boy 20-29 (probably Alson), and Arden was 40-49. There was one girl 5-9 (probably Pluma), one girl 10-14 (probably Rachel), two girls 15-19 (probably Lorenda and Irene), and Arden's wife was 40-49. The Arden II listed by McPherson on page 190.2 is Arden Benjamin Holcombe, son of Levi and Martha (Benjamin) Holcombe, and does not belong in this family. There was a Jay Holcombe enumerated in the 1830 Simsbury, Hartford Co., CT federal census, with 2 males 20-29 and one girl 10-15. This could be Arden Jay and his brother Guy, and a sister? [S23] Jesse Seaver, The Holcomb(e) Genealogy, Page 62. [S25] Hannah McPherson, Holcombe Genealogy, Page 190.2/Item A-8-1-10-10-2. Seaver gives birth date as May 4, 1761. Ebenezer served, 1778-79, in Capt. William Judd's company, Col. Samuel Wyllys's Connecticut regiment. DAR application 73223 gives death as 5 Mar 1825. [S104] DAR DAR Lineage book, Vol. VII:Pg. 132/item 7395 and Vol. XIII:Pg. 9/Item 12026; Vol. LXXIV:Pg. 84/Item 73223; Vol. XC:Pg 158/Item 89488. [S123] Unknown author, "NSDAR Application Number 7395." [S25] Hannah McPherson, Holcombe Genealogy, Page 192/Item A-8-1-10-11. [S104] DAR DAR Lineage book, Vol. LXXIV:Pg. 84/Item 73223. Bowman, on vol. 1, page 161, lists two husbands for Candace, Thomas Spring and Anson Cooley. This is apparently an error, which she corrects in vol. 2, page 128, item 810425. Seaver and SS say Candace's spouse was Thomas Spring. DAR Records #7395 and #12026 also listed Thomas Spring. McPherson only lists Thomas Spring. There was a second Candace, daughter of Sereno and Cynthia Ann (Wilcox) Holcombe. Documentation for her marriage and children is listed there. Candace Holcombe was born on 20 June 1809. She was the daughter of Ebenezer Holcombe and Chloe Bacon. Candace Holcombe married Thomas Spring III, son of Thomas Spring II and Jerusha Pomeroy, in 1824. Candace Holcombe died in 1869. [S65] Deanna Holcomb Bowman Thomas Holcomb, Vol. I:Pg 161/Item 81098. [S104] DAR DAR Lineage book, Vol. VII:Pg. 132/item 7395 and Vol. XIII:Pg. 9/Item 12026; Vol LXXIV:Pg. 84/Item 73223; Vol XC:Pg. 158/Item 89488. [S25] Hannah McPherson, Holcombe Genealogy, Page 192.1/Item A-8-1-10-11-10. Chloe Holcombe was born on 7 January 1796. She was the daughter of Ebenezer Holcombe and Chloe Bacon. Campbell Holcombe was born on 25 January 1800. He was the son of Ebenezer Holcombe and Chloe Bacon. [S161] Carol A. Laun, Granby Center Cemetery, Page 131. Horace Holcombe was born on 7 January 1794. He was the son of Ebenezer Holcombe and Chloe Bacon. Horace Holcombe died in 1873. Zophar Holcombe was also known as Topher Holcombe. He was born in 1790 at CT.2 He was the son of Ebenezer Holcombe and Chloe Bacon. Zophar Holcombe married Lucy Goddard, daughter of Isaac Goddard and Rosanna Holcombe, circa 1811 at CT. Zophar Holcombe died after 1860 at LaSalle Co., IL. Zophar and Lucy were enumerated in the 1850 Troy, LaSalle Co., IL, federal census. He was a farmer, age 60, she was 57. The only child in the household was Warren 21. 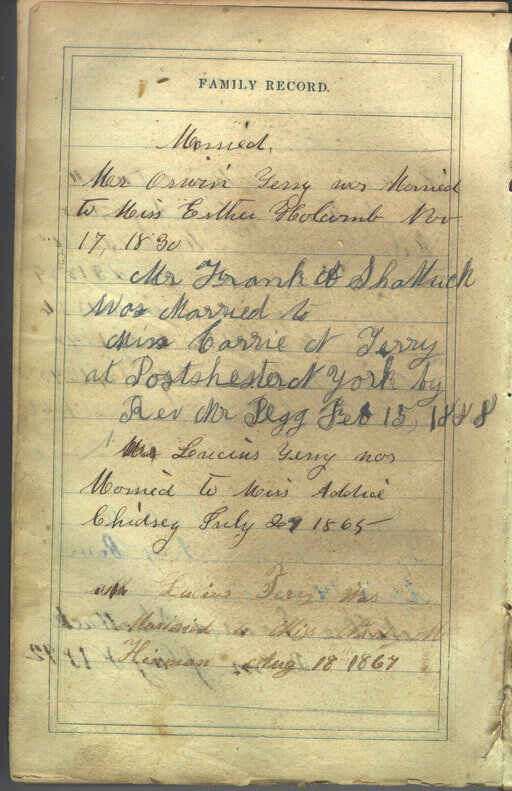 Zopher and Lucy were enumerated in the 1860 Olive, Clinton Co., IA, federal census. He was a farmer age 68, she was 68. Also in the household was Warren and his wife Sarah E. and their children Alma 7, Alfred, and James. [S25] Hannah McPherson, Holcombe Genealogy, Page 192.1, Item A-8-1-10-11-5. Kathy Stephens shows Lucy born on 6 April 1793, this however, may be an error, assuming the birth date of Lucy, daughter of Rufus (GVR). Ebenezer is recorded in the 1850 census of Simsbury as a laborer and had his mother, Chloe living in his home with him, wife and a child who turns out to be their grandchild. 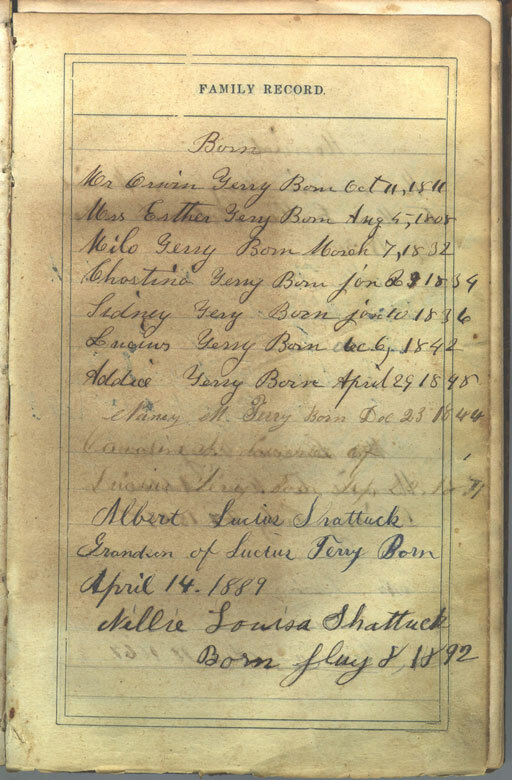 Ebenezer and Almira are recorded in the 1860 Granby, Hartford Co., CT, census with Lewis M.
Ebenezer and Almira are recorded in the 1870 Granby, Hartford Co., CT, census, page 24. McPherson lists a child Lewis M. born in 1840-41. Carol Laun goes into great detail in explaining that this was their grandchild and that their son Lewis Monroe Holcombe Sr. was widowed and had gone west and had since died. See the Connecticut Nutmegger September 1995 and September 1996 for complete details and primary source material. Carol can also be contacted at the Salmon Brook Historical Society, Granby 06035; or through the Connecticut Society of Genealogists, Inc., the publisher of the Connecticut Nutmegger, at Box 435, Glastonbury, CT 06033-0435. It is not known if Ebenezer is burried in West Granby or in the Granby Center Cemetery, but his fahter owned a plot in West Granby. [S25] Hannah McPherson, Holcombe Genealogy, Page 192/Item A-8-1-10-11-1. [S144] Carol Laun, "unknown short article title." [S145] Carol Laun, "unknown short article title." McPherson and Seaver call Almira, "Almira Foster". In the Connecticut Nutmegger, September 1995, Carol Laun calls her "Almira Alderman Foster Holcombe" and goes into a lengthy discussion of the facts. On the petition of Almira foster of Granby in said county, shewing to this court that on the 9th day of March A;D. 1803, she was lawfully married to Zacheriah Foster then of said Granby, and that on or about the 10th day of September A.D. 1808, he willfully deserted her, went out of this State and now resides in the State of Pennsylvania, and hath ever since said 10th day of September continued his desertion in the total neglect of his duties to her; praying for a bill of divorce, as by petition on file dated August 29th 1812. Ordered by this court, That notice of the pendency of this petition be published immediately afterthe rising of this court six weeks successively in two newspapers printed in this state, that the respondent (if he see cause) appear before this Court, next to be holden at Hartford in said county, on the second Tuesday of February next, then and there to defend in this cause. [S25] Hannah McPherson, Holcombe Genealogy, Page 192/Item 8-1-10-11-1. [S45] Albert C. Bates, Simsbury, Page 207. Orwin and Esther were enumerated in the 1850 Avon, Hartford Co., CT, federal census. He was a laborer, age 39, she was 41. Children in the household were Milo 12, and Lucius 7. Widow Esther was enumerated in the 1860 Avon, Hartford Co., CT, federal census. She was 52 and son Lucius was 17. [S25] Hannah McPherson, Holcombe Genealogy, Page 192.1. The death year for Orwin listed in the bible is not clear with 1852 listed first in a light ink and another year, perhaps 1850, in a darker ink. However, given that he was enumerated in the 1850 census, the 1852 date is probably correct. Cyrus Holcombe was born on 14 December 1762 at Simsbury, Hartford Co., CT.1 He was the son of Lt. Peter Holcombe and Tryphena Case. Cyrus Holcombe married Anna Cady. Cyrus Holcombe was buried on 25 November 1826 at Old Marcellus Village Cemetery, Marcellus, Onondaga Co., NY. Anna Cady was born circa 1766. She married Cyrus Holcombe, son of Lt. Peter Holcombe and Tryphena Case. Anna Cady died on 12 October 1811. There is no specific reference in Seaver as to the mother of the children listed so all born befoe 1805 will be listed to Bacon, all after to Rowe. Jacob, Theodocia and Susannah are all buried in the Granby Center Cemetery. Jacob was enumerated in the 1850 Granby, Hartford Co., CT census. Sylvester age 41, wife Sarah and their child Wilbur were also in the houehold, as was Charles, age 38. Hannah, age 78 was listed last after all the children and hired help. [S65] Deanna Holcomb Bowman Thomas Holcomb, Vol. I:Pgs. 161-2. [S25] Hannah McPherson, Holcombe Genealogy, Page 192.2/Item A-8-1-10-13. [S45] Albert C. Bates, Simsbury, Page 248.